Less than a week after record-breaking flooding, the effected areas of the Philippines are being threatened by resulting disease, hunger, hostility and more typhoons. 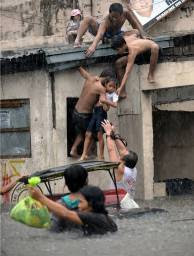 According to the National Disaster Reporting Council [http://ndcc.gov.ph/home/], more than 2.5 million people were affected, nearly 700,000 of whom are in 700 evacuation centres scattered around the capital; others are staying with either family or friends. When the water levels rose, endless amounts of waste was dispersed in the process. According to IRIN News, only three portable toilets have been set up in a school district east of Manila serving as an evacuation centre. This district, now home to more than 3,000 survivors, received the brunt of the flooding. IRIN reported that the old plumbing system had backed up after the flood, causing the waste to soak into the ground which serves as a bed for flood survivors. "We need medicines, and we fear a disease outbreak, especially skin fungus, because many people have been constantly drenched since the storm," said Aldrin San Pedro, mayor of suburban Muntinlupa, south of Manila, adding that much of the area remains waterlogged. Private doctors and health workers are being recruited to help with the horrific aftermath. Psychologists are hoping to help survivors cope with post traumatic stress, especially children. IRIN also reported that survivors are becoming hostile in their fight for food due to the slow delivery of aid. "The level of frustration has been running high. People are emotionally unstable, hot-headed," said Jose Vidal, who heads camp management at Concepcion Uno, the aforementioned school district. Some have been caught fighting for boxes of donated clothes and food. “We don't want to appear as if all norms of decency have gone away with the floods, but in this situation, when people are extremely hungry, fighting is bound to erupt,” said an organizer from another evacuation centre. The Philippines are still fighting for stability as another tropical storm is brewing. Typhoon Parma, with sustained winds up to 195 km/h, is forecast to strike the northern island of Luzon any time in the next two days. Officials are encouraging immediate evacuation and are calling for more international aid. 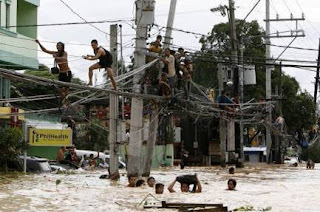 To join FH Canada in response to this emergency, go to: http://www.fhcanada.org/Flooding-Brings-Havoc-to-Philippines?sc=1&category=-101#atssh-email.